Homespun Stitchworks..... For the love of vintage: The Suffragette embroidery of 1912. The Suffragette embroidery of 1912. With the anniversary of the suffragette movement today I wanted to share with you all the a piece of embroidered history. I hope you enjoy reading this today. It is fairly long but all the ladies had to be named. They fought bravely for us and some died for us. Women's suffrage in the United Kingdom was a movement to fight for women's right to vote. It finally succeeded through two laws in 1918 and 1928. It became a national movement in the Victorian era. Women were not explicitly banned from voting in Great Britain until the 1832 Reform Act and the 1835 Municipal Corporations Act. As well as in England, women's suffrage movements in Wales and other parts of the United Kingdom gained momentum. The movements shifted sentiments in favour of woman suffrage by 1906. It was at this point that the militant campaign began with the formation of the Women's Social and Political Union. 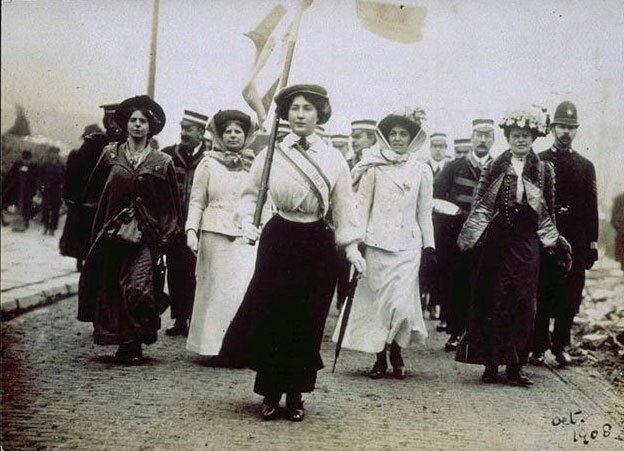 The outbreak of the First World War in 1914 led to a suspension of all politics, including the militant suffragette campaigns. Lobbying did take place quietly. In 1918, a coalition government passed Representation of the People Act 1918 , enfranchising all men, as well as all women over the age of 30 who met minimum property qualifications. In 1928, the Conservative government passed the Representation of the People ( Equal Franchise) Act giving the vote to all women over the age of 21 on equal terms with men. The movement became very militant and there was breaking of windows, hunger strikes and chaining themselves to railings and lamp posts. Many of the suffragettes were tried and put into Jail. In Holloway Prison 66 signatures were embroidered on a handkerchief and it was dated as March 1912. It was probably embroidered in the ladies limited exercise periods. was one of the two grandmothers whose names appear on the handkerchief. firing a blank shot at a policeman trying to arrest Mrs. Pankhurst. by the prisoners & she took the part of Narissa. was often done to protect a husband or family. of June without being forcibly fed. she was imprisoned again for setting fire to a house & some haystacks in Suffolk. She was arrested in March but no further information is available. little else is known of her. imprisoned again, for four months in March. strike & was forcibly fed. three days – someone else did my three weeks”. also wanted to protest against the vindictive sentences given to WSPU supporters. struggle until they had reached their objective. She had been imprisoned in November & was sentenced to six months in March. several times, in London, Leeds, Hull & Cardiff. was released early, in June, in a very weak condition. She was forty-two years old. June. She was forty years of age. also took part in an attack on the Wallace Monument in Stirling. She was sentenced to two months hard labour. nasal tube. She seems to have been released at the end of May. Alice J. Stewart Ker (1853-1943). C. L. & C. E. L.
arrested on March 1st & was eventually bound over & released in Early April. Kate Lilley & Louise Lilley. She was sentenced to two months. Sentenced to two months hard labour. months & was forcibly fed after going on hunger strike. Frances M. McPhun (1880-1940) & Margaret McPhun (1876-1960). the WSPU hunger strike medal. She had been arrested in November & was sentenced to three months in March. organiser of the Newcastle & District branch. London especially for the March demonstrations. She was sentenced to two months. Janet Arthur) for trying to blow up Burns Cottage in Alloway. Sentenced to two months imprisonment. the hunger strike & being forcibly fed. expected her bed to be made for her, much to the amusement of the other prisoners. the Government alone, held it in their power to stop any further scenes of disorder. She was sentenced to four months. breaking Post Office windows. In March 1912 she was sentenced to four months. Dorothea Herlet Rock & Madeleine Rock. She went on hunger strike & was released, without being forcibly fed, in June. being arrested or on trial in March 1912.
that their salvation lies in looking after their own needs & in demanding the vote”. the police found eight more stones in her pockets. banquet but the King refused to prosecute. were also active WSPU members & were imprisoned in 1912.
been restrained by the leaders, she would do the same thing again & possibly worse. fed by nasal tube before being released at the end of June. went on hunger strike & was released in June without being forcibly fed. known of her involvement with women’s suffrage in this country. hunger strikes of 1912 & fifteen were forcibly fed. Text transcribed from the original research & writings of Barbara Miller with additional research by Antony Smith. The hanky that is pictured was found in a pile of fabrics to be burned in the 1970's after a jumble sale! can you imagine ..... We would have lost this very important piece of history of women, who fought for us to be equal. I am so glad you enjoyed your read Julie. Amazingly brave women. We do rather take it all for granted now. What a shock for the lady who thought she would have her bed made for her in prison. Sounds so dreadful. We owe them so much. Thank you glad you enjoyed the read! Yes we do tend to take it for granted rather but I want to mark it .. we indeed owe them so much. Making the bed made me chuckle too! .. Thank you for bringing this item to our notice, I have always been well aware of the suffrage movement, and was told many things by my Grandmother who lived in London till 1918. She was always so keen to use her vote until almost the end of her life in 1972. As an embroiderer I greatly enjoy your blog and your stitching tales. Thank you I am so pleased you enjoyed reading my blogs and about the suffragette embroidery.. to think it was to be burnt!! Thank you for taking the time to comment as well. Wow your Grandma probably had some tales to tell. My father when I turned18 made me vote saying women died so you cold.. it was instilled in me and I am grateful it was. We are so lucky these ladies fought so fiercely. My love of slow stitching and samplers. Miss Muddy Beak and slow stitching! Delicious antique papers, penmanship and fabrics. Beauty made one stitch at a time!